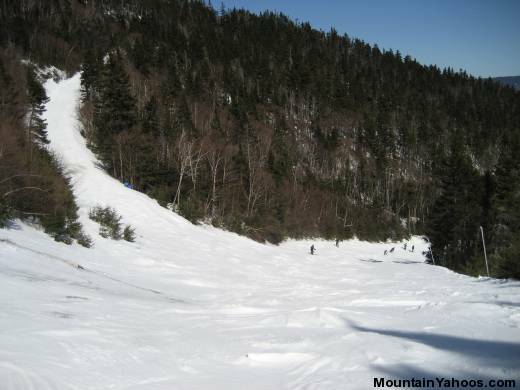 Valley Ski Resort is located at the southern part of the White Mountains National Forest of New Hampshire. 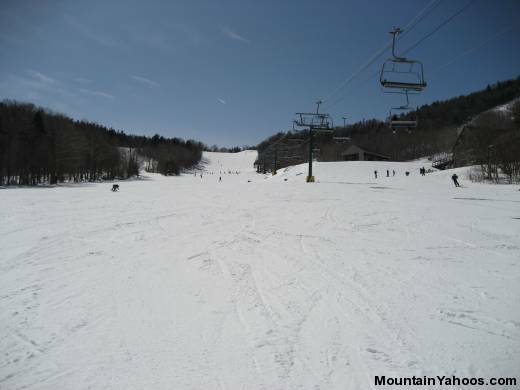 It covers 500 acres where 259 of them are skiable. 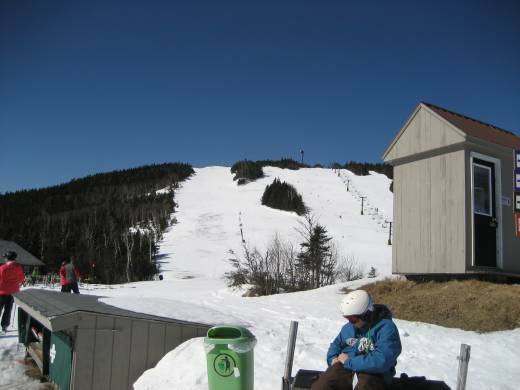 The peak is at 4004 feet and there is 2020 feet of vertical drop for skiers and snowboarders to enjoy. 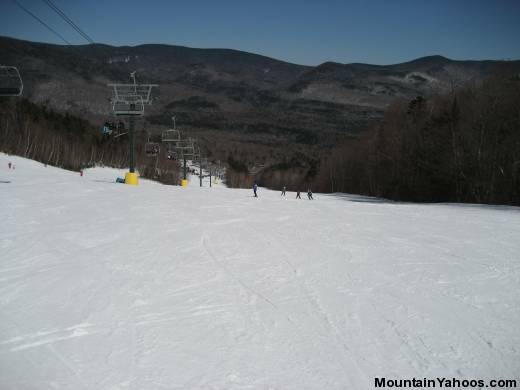 Waterville is very accessible from many large cities in the north east. Boston is only 2 hours away while Providence is about 2.5 hours away by car. 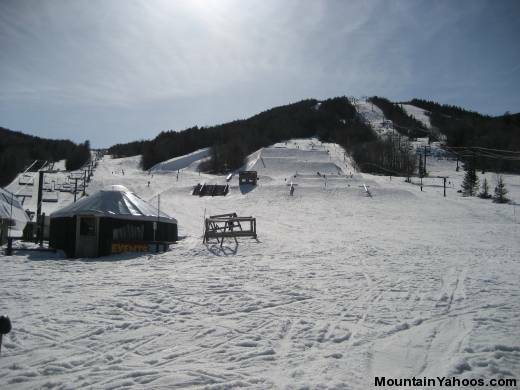 Waterville Valley is a small mountain village that has some great deals, such as free kids skiing in January and 3pm checkout on Sundays. There is plenty of free parking at the base of the mountain that is within walking distance if you can't wait for the free shuttle bus to take you to the base lodge. There is also drop off parking (15 minutes) and even on a busy day in March there were no problems finding such a parking spot. Valet parking is also offered for $20. 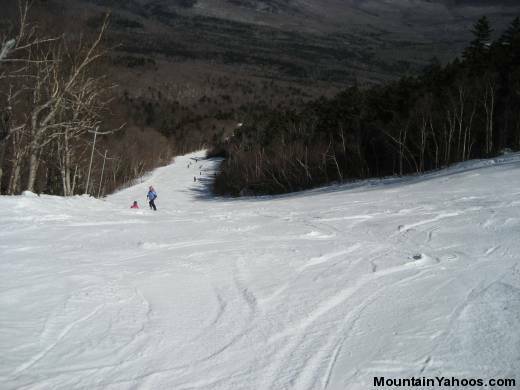 All the trails are on one mountain, which makes is very easy to get around and skiers don't have to worry about getting on the wrong lift or trail and spend a lot of time getting back on track. 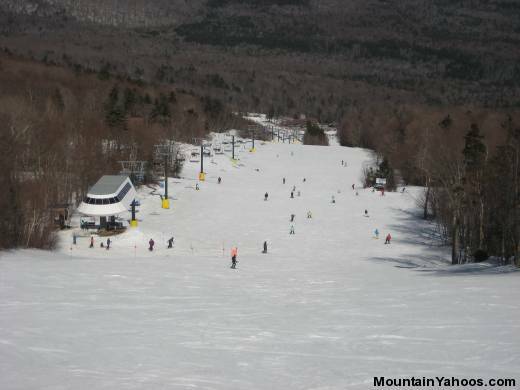 Most of the mountain is accessible from the high speed White Peak Express Quad which starts at the base lodge. This makes it convenient for families or groups that wants to stay together. 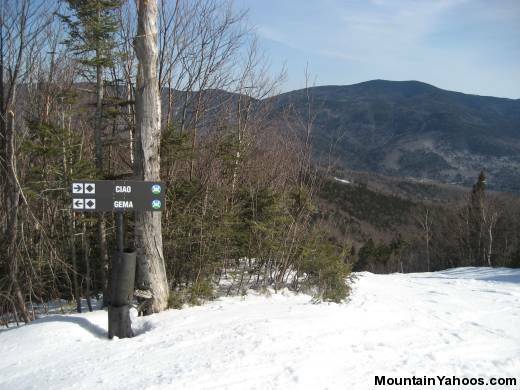 Most of the mountain, how ever rated on the trail map, would be considered to be intermediate. 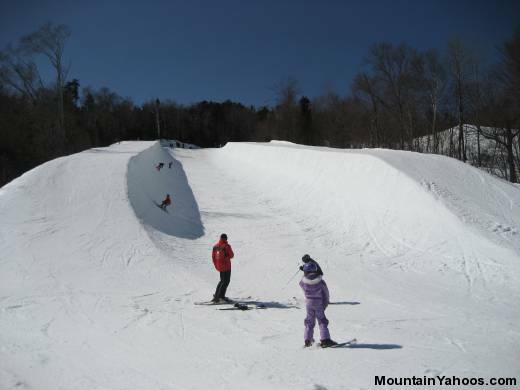 There are also a few terrain parks as well as a Superpipe for those who want more challenges. The easiest trail is the Valley Run at the bottom left of the mountain and can be accessed from the Quadzilla High Speed Quad;". 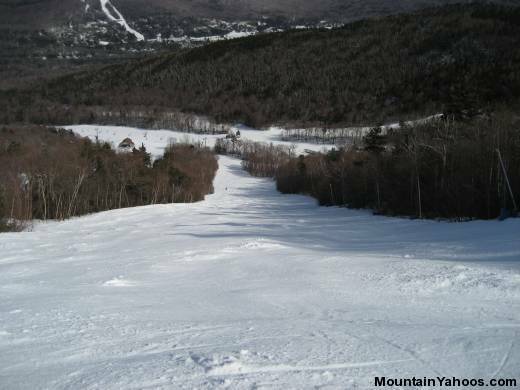 This is a rather short run, and after a couple of warm up runs, it's recommended that the White Peak Express Quad is taken and then take the Oblivion, which is a nice groomed trail that will lead into the Upper Valley Run and then the Valley Run. However, the best intermediate run is probably the Tippecanoe that leads into the Lower Tippecanoe (Tippy) and the Lower Periphery on the right side of the mountain. 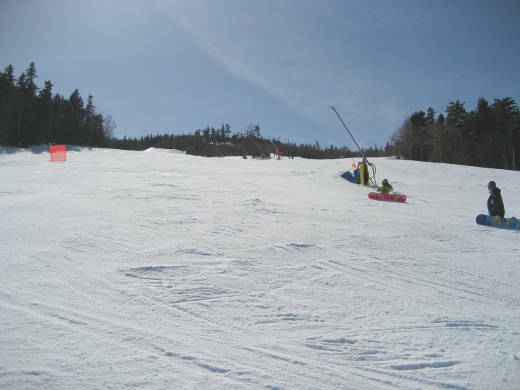 These are nice wide groomed trails that most people will enjoy since it's steep enough that the more advanced skiers will enjoy the speed and quick turns that can be achieved here. 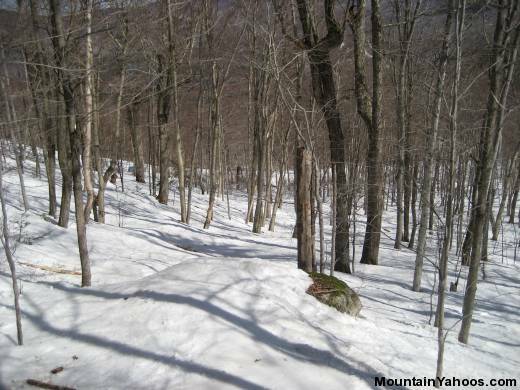 There are also some very nice intermediate trails on the peak of the mountain. 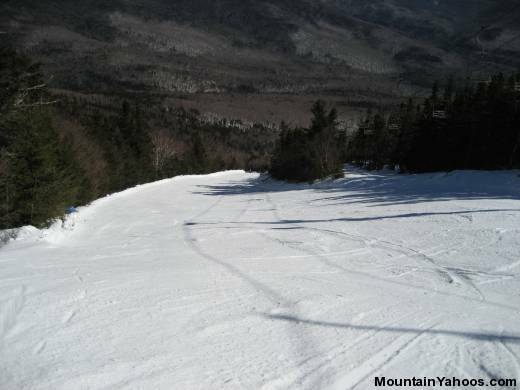 It is pretty open at the peak and a little bit icy, but under different conditions the skiing here would probably be great. The view from the peak is also very nice. 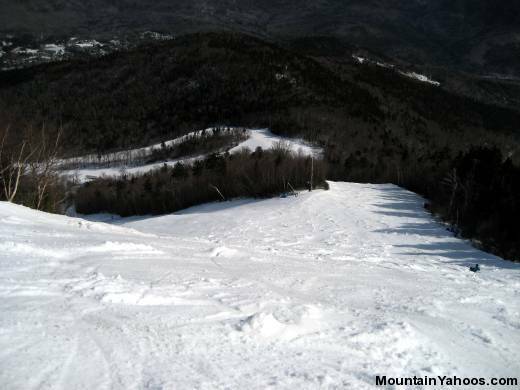 To get to the peak, first take the White Peak Express Quad, and then get on the High Country Double. 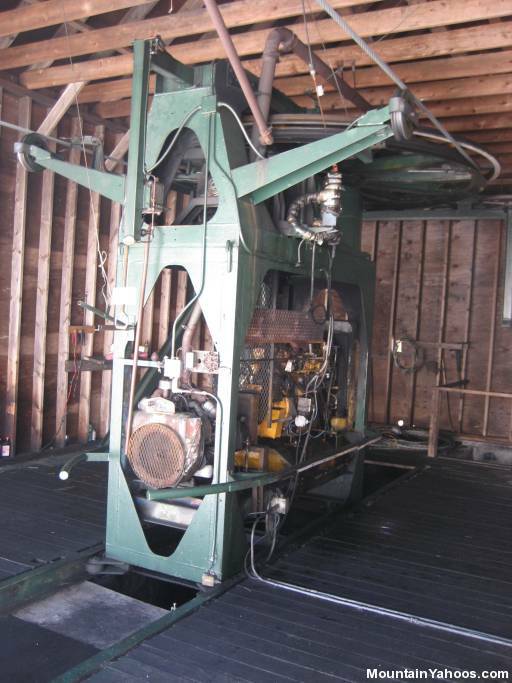 This was the first time MountainYahoos experiences a chair lift powered by a huge old diesel engine! What this lift lacks in speed, it makes up in nostalgia and it's well worth the experience to take this lift. with Sunny Side Triple chair on the left. 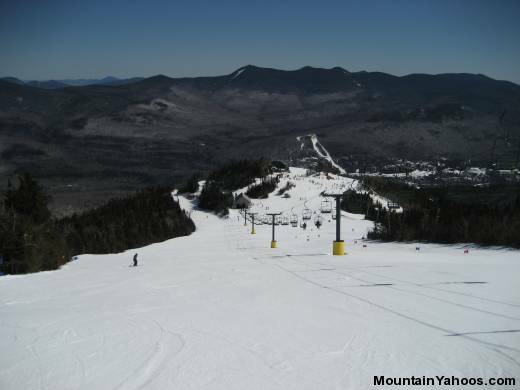 Top of Waterville Valley accessible via the diesel powered High Country double chair lift. Looking down from the peak. 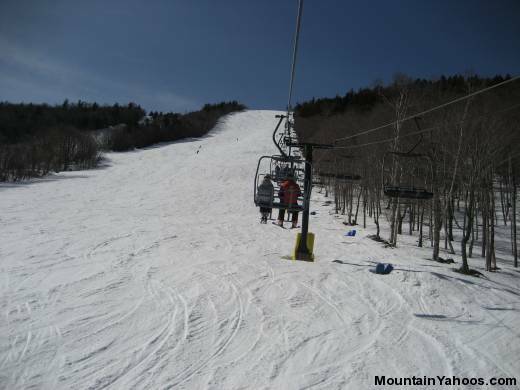 A very unique diesel powered chair lift at Waterville Valley will take you to the peak. 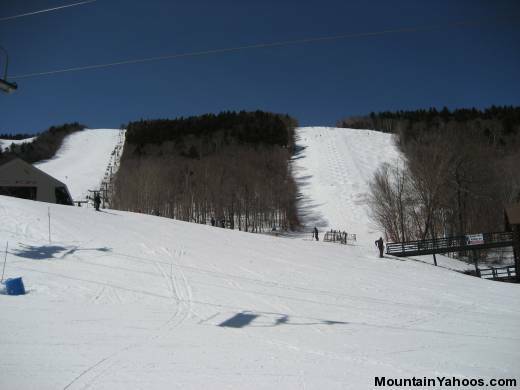 Although there isn't really anything at Waterville Valley that requires advanced and expert skills, there are still some runs that are great and that the expert skier/boarder will enjoy. 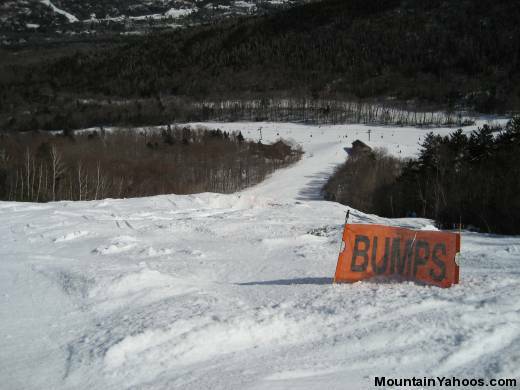 All the "expert" runs can be accessed from the White Peak Express Quad, but the best black trails are on the left side on the mountain. Both Ciao and Gema are single black runs that are groomed, so this is a good place to practice making quick turns at higher speeds. Next to Gema is True Grit, and this is rated a double diamond, but it is not much steeper than Gema. 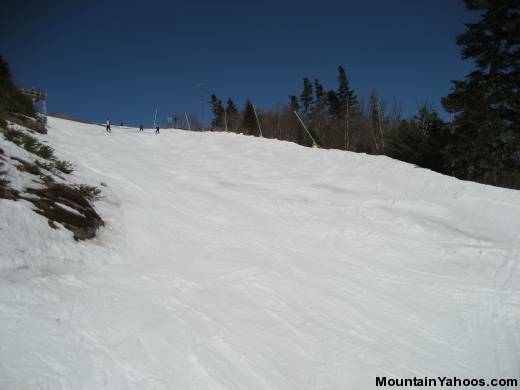 It wasn't groomed as well as Gema, and although it wasn't a true mogul run, it might be the reason it had another diamond after it. 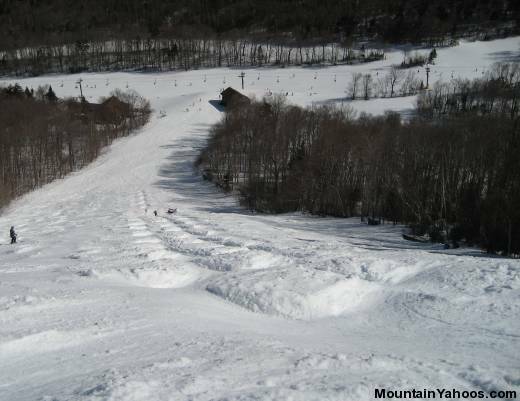 Regardless, this is also a great run that MountainYahoos spent a lot of time on. 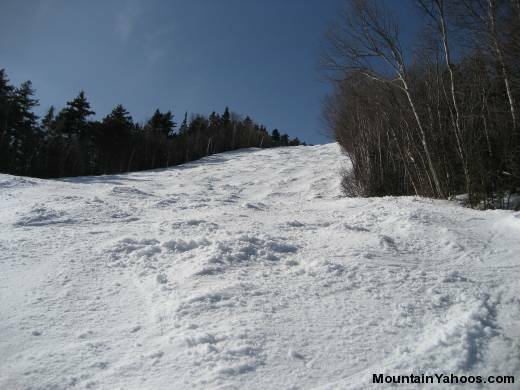 The best part about skiing these three trails that are next to each other is they are all accessed from the Sunnyside Triple chair that more or less only covers the most difficult terrain. No need to wait around for "everybody" else to get up on the mountain! Lift lines were very short here. There is also another good run on the other side of the mountain: The Boneyard. This can be accessed by taking the White Peak Express Quad and then ski down Tippecanoe until it runs into The Boneyard. The Chute underneath the White Peak Express quad is also pretty nice. 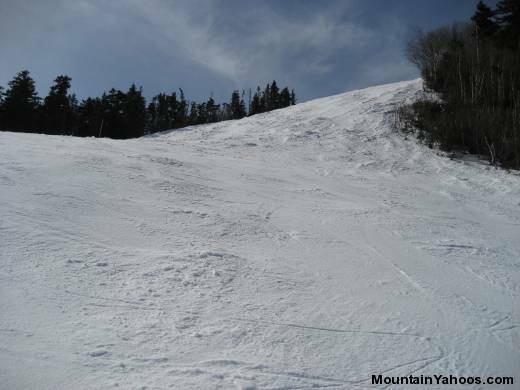 Run: On the White Peak Express with The Chute below. Run: True Grit with the Sunny Side Triple on the left. 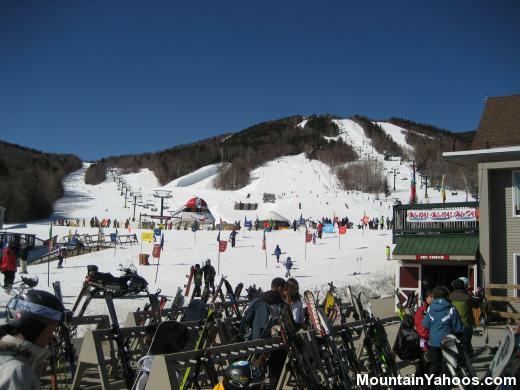 Ciao and Gema: Two very good choices at Waterville Valley! 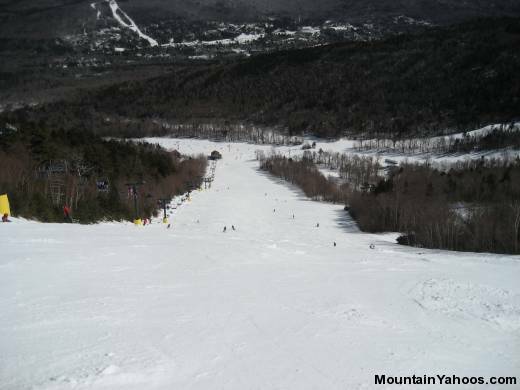 There aren't a lot of mogul runs at Waterville Valley, but what it lacks in quantity it makes up for in quality. 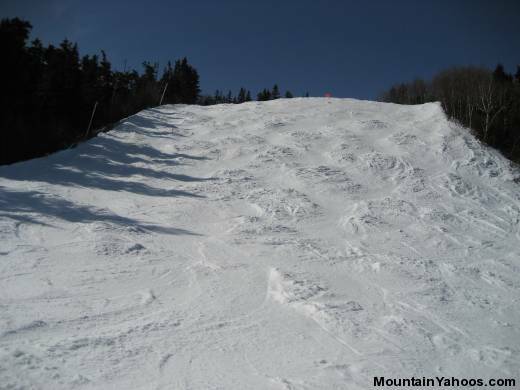 Lower Bobby's Run is a World Cup standard mogul run with two built in jumps. This is where the Vancouver 2010 woman's mogul gold medalist Hannah Kearney got her skills, so this run should be enough for the rest of us to practice on! 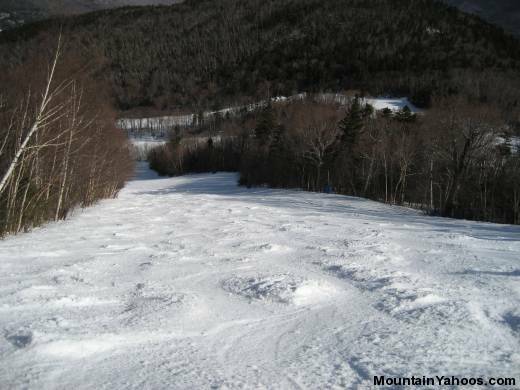 Lower Bobby's Run can be accessed from either the White Peak Express Quad or the Sunny Side Triple. 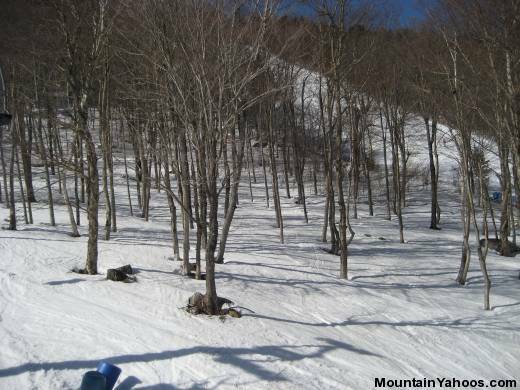 There aren't a lot of glades at Waterville Valley, especially at the end of March, but the glades between True Grit and Lower Bobby's Run are very nice. 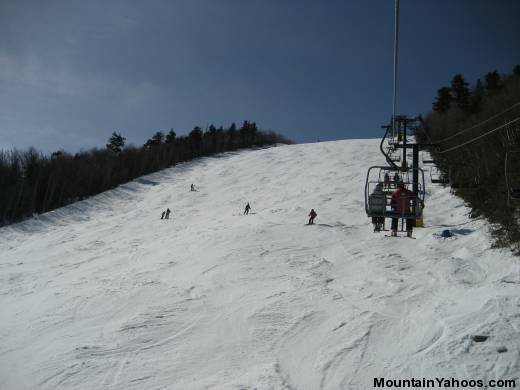 MountainYahoos would love to come back next season earlier in the season when the conditions are better. 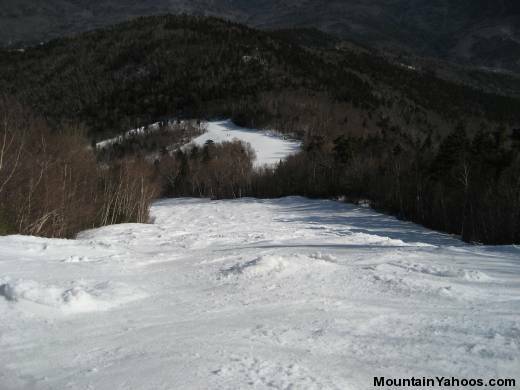 Run: Glades between True Grit and Lower Bobby's Run. 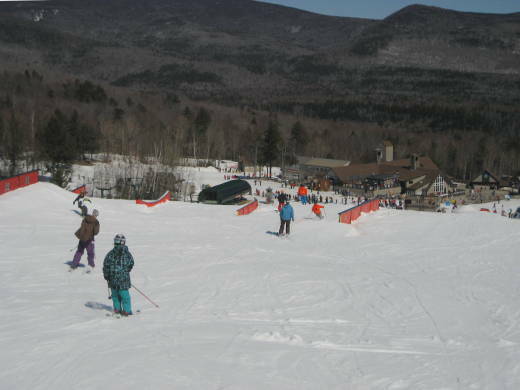 There are several terrain parks at Waterville Valley. 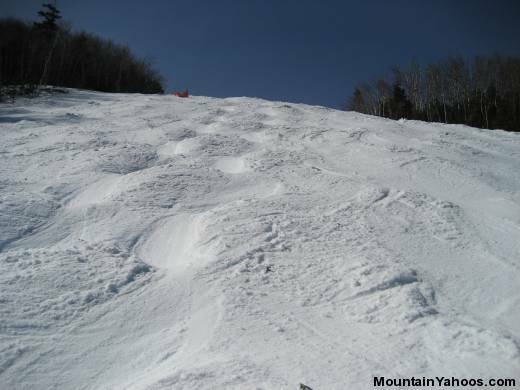 The Little Slammer and Leroy's Loop are for beginners and are located at the bottom of the mountain, while Psyched Out is for the more advanced and can be accessed from the White Peak Express Quad and by taking the Upper Bobby's Run down to Psyched. 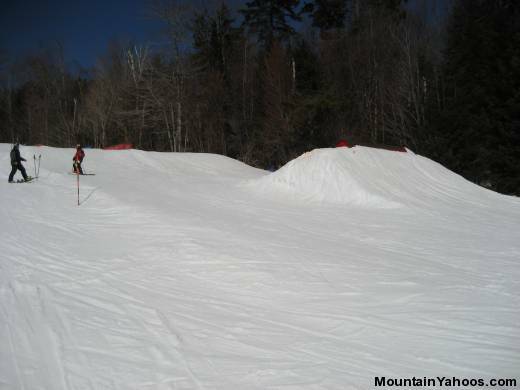 This will end up at the Exhibition Park and the Superpipe! 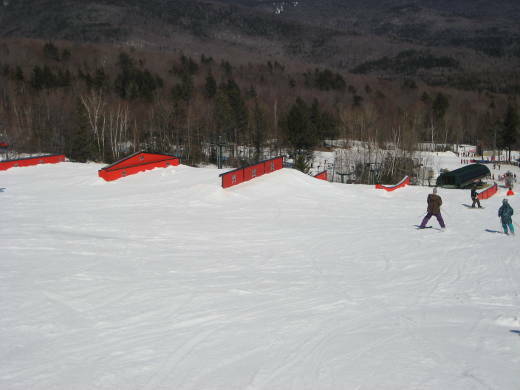 Run: Waterville Valley terrain park at the base of the mountain. The most active Apres Ski festivities are at T-bars above Top Dog Rentals. 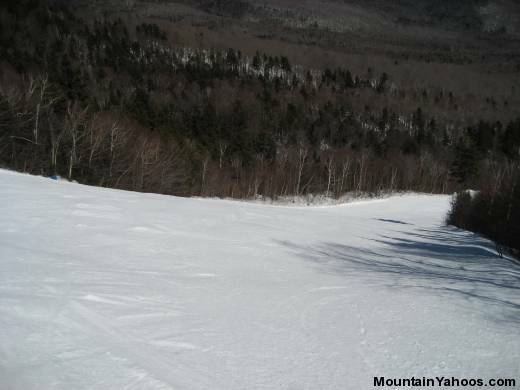 An extensive network of cross country ski and snow shoe trails are available at the Waterville Valley Nordic Center. 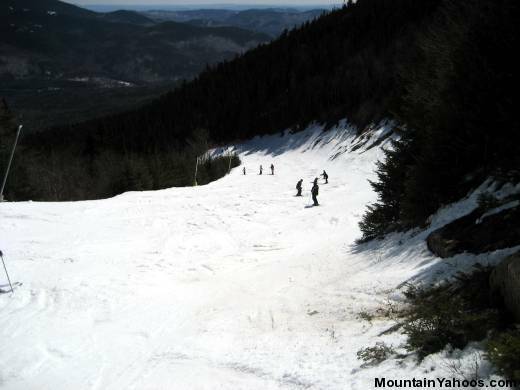 Trails are wide and groomed with views of the scenic White Mountain National Forest. At the North end of the trail system is a trailside warming yurt (hut of the nomadic tribesman). There are even trails for pet accompaniment. There are many options at the base village or in town for the evening. There are may ski and souvenir shops in the base village and even more in the town center. Go to Legends 1291 Night Club for dancing and late evening action. 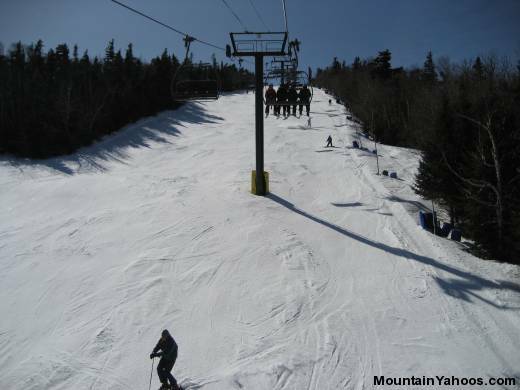 Waterville Valley serves skiers in the New England area. Note: a GPS may recommend Sandwich Notch Rd. and/or Tripoli Rd. 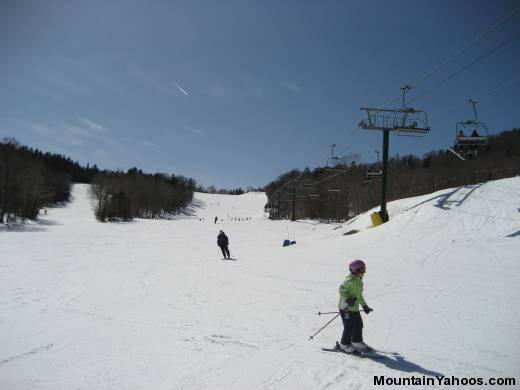 (via Lincoln, NH) but they are often closed during the winter months.